A new genetic directory launched today will enable researchers and breeders to scan the genomes of wild relatives of modern wheat to find disease-fighting properties lost to domestication. The time-travelling trawl is possible following the launch of the Open Wild Wheat, a directory which includes the genetic sequences of 150 wild wheats belonging to a goat grass species called Aegilops tauschii ssp. strangulata. 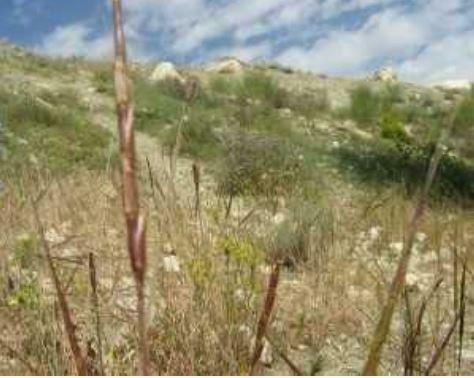 This wild relative, found in the fertile crescent round the Caspian sea, has contributed the D genome pillar, one of the three genomes found in bread wheat. The directory is the crowd-funded outcome of an international consortium led by wheat researchers at the John Innes Centre, Norwich, UK, and Kansas State University. Contributors from academic institutions and industry spanning 15 countries raised $150,000 to fund the sequencing. Dr Brande Wulff, from the John Innes Centre, explained the motivation behind the project: "If you sequence a single individual you just get a snapshot. So, to understand the whole genetic diversity that comes with a species we decided to sequence not one but 150." Wild wheats come with plenty of feral characteristics including seed-shatter, long generation times and off-putting spikes which can lead to choking in dogs and other animals. "At a time when our hunter-gatherer forefathers were transitioning to farming, they would have come across a field of plants and wild wheats. Our ancestors would have starved to death if they'd relied upon these for their daily bread," says Dr Wulff. Ten thousand years of domestication and intensive breeding has turned wheat into the highly nutritious, high-yielding, iconic crop that feeds much of the world population today. But this has come at a cost. The hardy relatives have something their elite wheat cultivar cousins do not have: genetic diversity within which lies protective traits such as disease resistance as well as variation in flowering time and micronutrients. Dr Jesse Poland of Kansas State University, who co-leads the project, explained: "Over the last 100 years, breeders and farmers have been trying to recruit some of that genetic diversity back into the elites, but it's an uphill struggle. It takes many years of breeding to produce a wheat strain which combines high-yielding, bread-making properties with just one resistance gene from the wild relative." The Open Wild Wheat directory offers a "diversity" panel which allows researchers and breeders to search for candidate disease resistance genes and other useful variation. The resource has emerged alongside two complementary technologies: speed cloning, a resource which allows breeders to clone candidate genes recovered from the directory; and speed breeding, the intensive wheat growing platform developed by Dr Wulff alongside colleagues from the University of Queensland. Speed breeding allows traits from wild relatives to be moved rapidly into elite varieties, prior to field trials. Dr Carolina Paola Sansaloni one of the collaborators from CIMMYT said: "We are going back to the wild relatives of wheat to identify and incorporate into modern cultivars the hardy genes lost during evolution and domestication of wheat." The directory assembled by the consortium contains enough data, if printed on A4 paper, to stretch almost to the moon. Searching for the needle in this statistical haystack involves scanning genetic variation for small sequence signatures – candidate genes – associated with resistance or susceptibility to diseases such as wheat stem rust or powdery mildew. And the technology works, says Dr Wulff: "We have cloned four resistance genes using this technology, so we know it's effective. We can really speed up the discovery of resistance genes. We can recover the very best from the past to make a great crop even greater. "